Belle région proche de la mer et du parc national d'Akamas, ambiance très conviviale avec beaucoup de restaurants, bars et magasins locaux. Cuisine entièrement équipée, barbecue extérieur, Patio, TV satellite, WIFI, beaucoup de stationnement, salle de bains à l'étage, toilettes en bas, climatisation dans toutes les chambres. Beaucoup d'activités extérieures à pied, vélo, sports nautiques, excursions en bateau. Clean and tidy. Good, quiet location. We enjoyed our stay. Very nice modern town house. Everything you need on hand. Pool and surroundings spotless!! Would definitely recommend... Liz and Barry Edmunds. Lovely, peaceful home from home. 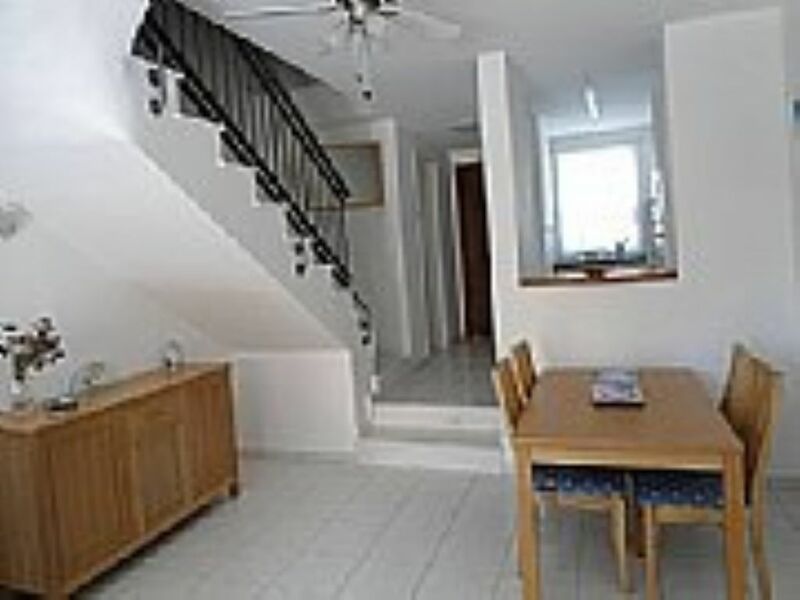 We booked this villa in Polis for a quiet holiday within a short walk of bars, restaurants etc. From the moment we booked, the owners, Sue and Lee were helpful and sent us all the relevant information, directions, key details. We arrived late at night and their directions were spot on, and then we found a thoughtful courtesy pack containing milk, bread butter etc, perfect start. The villa was spotless and had everything you would need for a pleasant stay. The air conditioners and fans were very effective in the lounge and bedrooms and the bed was comfortable too. Leaflets, maps, instructions and recommendations were on hand in a folder which was very useful . A private patio led down to a clean pool with plenty of sun beds and parasols, lovely and peaceful. An easy 10 minute walk to Polis square with plenty of lovely tavernas and shops. The locals were very friendly too. Just a 5 minute walk to a small supermarket or a bigger shop just a little further. We hired a car and drove to Latchi which was pleasant as was Troodos, with its monastery. We would love to return to this delightful villa as we felt we could’ve stayed longer than our booked 10 days! Thoroughly recommend this villa. We have just had a lovely 10 day break staying at this lovely holiday house. The house is very clean and comfortable. It has everything you need for a great holiday. It’s great that the swimming pool is a few steps off the patio. Most of the time it was just our family around the pool! We travelled as a family of four, kids aged 10 and 8, and we all enjoyed it here. The owners are very helpful and any queries we had were answered straight away. Polis and the surrounding area is lovely. It is very quiet and great for a relaxing holiday. We ate out every evening and found some lovely tavernas, our favourite was Santa Barbara which is about a 10 minute drive away from the house (turn right out of the main road from the house and keep going, it’s on the left hand side) the staff here are lovely, the food is fab and it’s right on the beach. We would definitely return to polis gardens. This is a little gem. It is in a quiet residential area and shares a pool with approximately 15 other properties, although there is really anyone else around or in the pool. At the most at any one time tended to be other family by the pool but that was very rare. There are friendly, permanent residents here as well which is quite handy for local information. It is a 10 to 15 minute walk from the Market Square which has a safe atmosphere in the evenings. It's also walking distance to a good supermarket. The apartment itself was clean and tidy as was the pool. Considering we went during the six weeks holiday and during the hottest month, the apartment stayed nice and cool with the air-conditioning. I would highly recommend this apartment. We had a lovely time. Our second visit and the house lived up to all expectations yet again, everything we needed was at hand and the estate is well maintained. Cette villa calme bénéficie d'une position enviable donnant sur le paysage rural de la forêt de Paphos et les montagnes Troodos au-delà.